Gwydir Castle is an ancient Welsh house situated in the beautiful Conwy Valley, in the foothills of Snowdonia. Regarded as one of the finest Tudor houses in Wales, the castle was formerly the ancestral home of the powerful Wynn family. By 1994, the house and garden and fallen into dereliction. Its restoration has taken over twenty years to complete and is still a work-in-progress by its current owners. Deeply evocative and atmospheric, it is a unique experience in country house visiting. Following a devastating flooding incident to the garden, we will be re-opening Easter, 2019 – slightly later than planned. With the help of our fantastic team of volunteers the clean-up is progressing well. We rely on your support (especially at this difficult time) so please do continue to visit us either for individual self-guided tours, group visits or B&B. We look forward very much to seeing you! Guided tours by arrangement for groups of 12 people or more. Please contact us for details. We will also open on Monday/Tuesday during the season for large groups, if bookings are made in advance. Limited refreshments are available by prior arrangement (we do a particularly good cream tea!) For day visitors, an informal, self-service tea-tent is available. We have recently set up a crowdfunding page to help raise funds to build a sandbag wall to protect Gwydir from flooding. Click Here. for further details. We are also home to: The Gwydir Press. 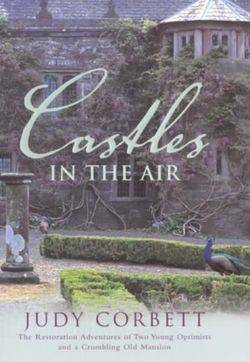 Castles in the Air is the autobiographical story of the rescue of Gwydir Castle. ‘The most remarkable architectural detective story of our time’ Tom Lloyd author of the Lost Houses of Wales. ‘A funny, intensely romantic story.’ Sunday Telegraph. ‘Hugely enjoyable. Corbett writes with great style and energy,’ Daily Mail. ‘The remarkable tale of one couple’s quest to restore a Welsh castle to its original, authentic grandeur – against all odds. Beautifully descriptive, this is a tale that reverberates with romance, suspense and great humour.’ The Good Book Guide. ‘Highly amusing…the best first hand ghost story I have read in years.’ Country Life.